183 Amtrak Passengers Rescued After 36 Hours Stranded In Oregon Amid Heavy Snow Crews succeeded in clearing the tracks so that a locomotive could pull the train to Eugene on Tuesday following a day-and-a-half standstill. An Amtrak train carrying 183 passengers finally chugged along Tuesday after a day-and-half standstill in rural Oregon amid heavy snow. The Red Cross provided food and coffee to weary Amtrak passengers who got off in Eugene, Ore., Tuesday after their train hit a downed tree and was stalled for a day-and-a-half. Earlier Tuesday, some passengers among the 183 onboard were moved to tears when their train finally began moving a full day-and-a-half after coming to a standstill around 6:20 local time Sunday night. 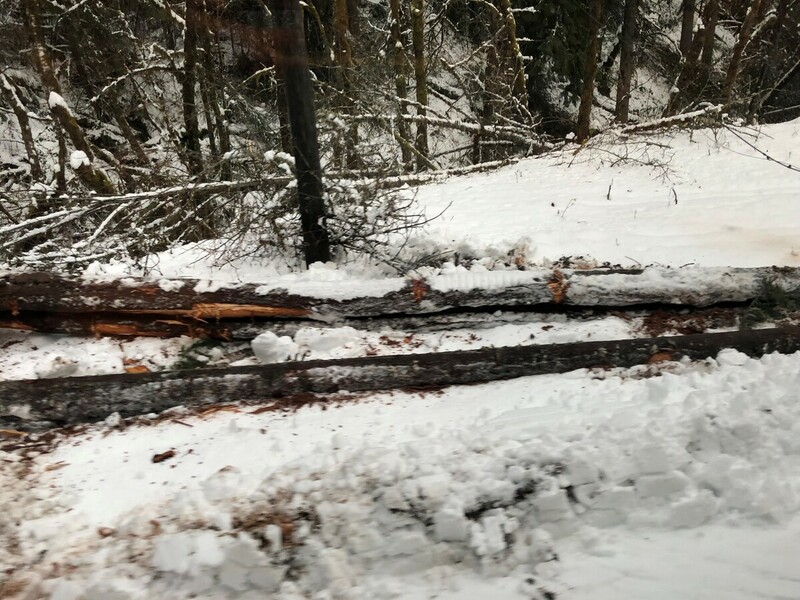 In a statement, Amtrak apologized to customers for the "extended delay," blaming "extreme weather issues" consisting of "more than a foot of heavy snow and numerous trees blocking the track." 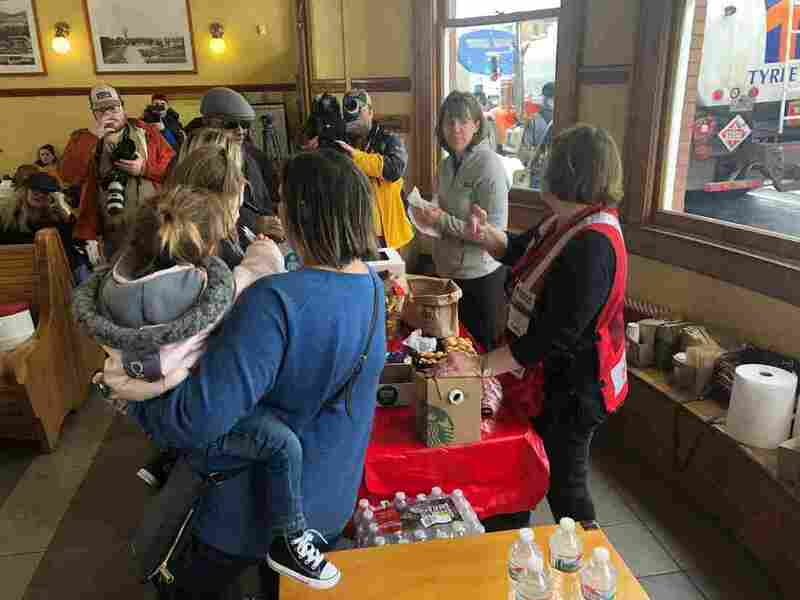 Amtrak spokeswoman Olivia Irvin told NPR that Eugene was the first destination for Coast Starlight Train 11 on Tuesday, with subsequent stops set for Portland, Ore., and then Seattle. But the ride remained rocky. "Because of weather conditions, it's really slow and really stop and go," Irvin said. The region was hit with a rare heavy snowstorm over the weekend, with accumulations reaching about a foot by Monday, according to the National Weather Service. Tim McMahan, a spokesman for Union Pacific, which owns the rail line, told NPR that crews worked through Monday night to clear the tracks so that a locomotive could pull the Amtrak train northward — a change of course for what had been a Los Angeles-bound journey. 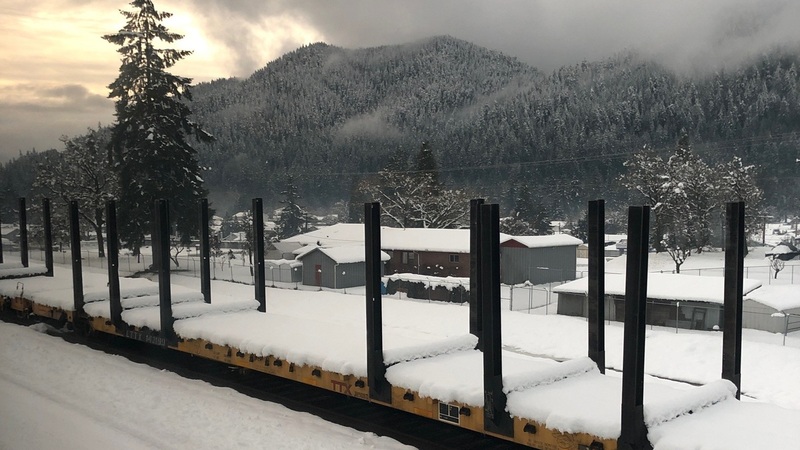 McMahan said Amtrak decided not to remove passengers from the train during the standstill and move them into Oakridge, Ore., because power was out in town amid the heavy snow and the company did not want to divide them among hotels. "We made every decision in the best interest of the safety of our customers," Amtrak said in the statement. Outside, the powdered Cascade mountains and snow-dappled trees made for stunning vistas. Inside, the atmosphere ranged from festive to restive as the hours ticked into days with no movement. Amtrak said the passengers were provided with "food, heat, electricity and toilets." Cell service was spotty, passengers said, and some of those who had access kept up steady stream of social media updates. "Exhausted," Rebekah Dodson, an Oregon-based author, posted to Facebook late Monday night local time. "Its been a full 30 hours stuck on #Amtrak outside Eugene, Oregon, trying to get home." But Dodson said some passengers were cheered by finding company in their misery. "I want to share some awesome things about people who are stuck together," she wrote. "They form friendships and tell stories and bond. #30hourtrainride. Real heroes of train 11: the ones that found each other." Dodson told The Oregonian that parents who ran out of diapers had resorted to using washcloths held together with safety pins for their children. Those onboard were resourceful in other ways, working to make the best of the situation. A woman with a ukulele serenaded children with "Old MacDonald Had A Farm." And a coloring station was set up for kids, according to Bigby. "Everybody was kind of helping the parents, like if they had snacks offering it to the kids," Bigby said. "Even when they would run up and down the halls, normally you'd have people who would complain but we were encouraging it, like, 'Get energy out!' "
Wyrick said that while train workers did their best to take care of passengers and provide free food, "nutritious food" stocks were depleted by Monday night. "They had snacks at the cafe, like potato chips, cookies, that kind of thing." Amtrak blamed the 36-hour standstill on "extreme weather" that produced a foot of heavy snow and "numerous" downed trees on the tracks. Some passengers expressed frustration over what they described as a lack of communication from Amtrak. They said they had no idea about when the train might move again, with many people missing days of school and work. Bigby, a middle-school health teacher in Klamath Falls, Ore., said she was anxious to get back into the classroom. "I had to call a sub for two days and that's two days I had to use my own personal leave for," she said. Amtrak said it will be providing passengers with refunds "and other compensation as appropriate."